Good coffee will make me forgive almost anything (high-prices, angry-for-no-reason baristas etc) and if Keurig pods represented a way to deliver improved quality to the casual coffee drinker, I’d view them as a net-positive, whatever other drawbacks there may be. But Keurig is not good. At under half an ounce per pod, Keurig coffee is weak, even at the machine’s strongest setting. It is also stale. It was stale before it was shipped; it was stale when you picked it off the shelf; it’s been stale the whole time it’s been sitting in its precious pod-tree on the countertop. ANY coffee that is ground, warehoused and then stocked at room temperature for weeks, possibly months, on end will be suboptimal. KEURIG IS NO MORE CONVENIENT THAN REGULAR COFFEEMAKERS. A coffee maker and a Keurig take the same amount of time to heat water, so there is no speed gained using a Keurig. 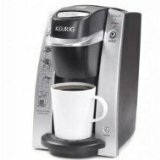 In the event that you want multiple cups, a KEURIG IS SLOWER than a conventional coffee pot because it is designed to handle one cup at a time and often needs to recover between servings. Discarding a used filter takes no more effort than discarding a used K-cup and, on those days when you’re serving multiple cups, discarding a single used filter is far less wasteful than discarding a K-cup for each serving. If you already have a Keurig machine, you can still get the most out of it by buying refillable k-cups and filling them with your favorite coffee. For the Keurig process we recommend Organic Italiano. This approach tastes better, costs less and is better for the planet. If you haven’t bought yet, consider a small coffee maker, a box of size #2 filters and a pound of something decent (or even freaking amazing) and stash it in the freezer until you feel like a cup. A full pot from a small coffeemaker still costs less than a single cup of Keurig, and the taste is vastly superior. The only danger is that your coffee-drinker status may go from “occasional” to “all day every day,” which isn’t a bad club to be in. JOIN US! Thank you for saying this. In addition, I am not sure what happens to plastic when it comes in contact with very hot water so I bought a 100% food grade stainless steele french press so all I take into my bod is pure coffee. I will give your coffee a try as soon as I run low on my current stash!